"Gioconda" butter free biscuit: Whip a meringue with 200 gr. egg whites and sugar. Mix up almond flour and sugar, egg yolks and whites (60 gr.) in a large bowl. Whip for about 10 minutes in order to condense. Dredge some sifted flour and stir carefully with a silicon peel. Add the meringue. Spread the dough on a pan on 1 cm. thickness. 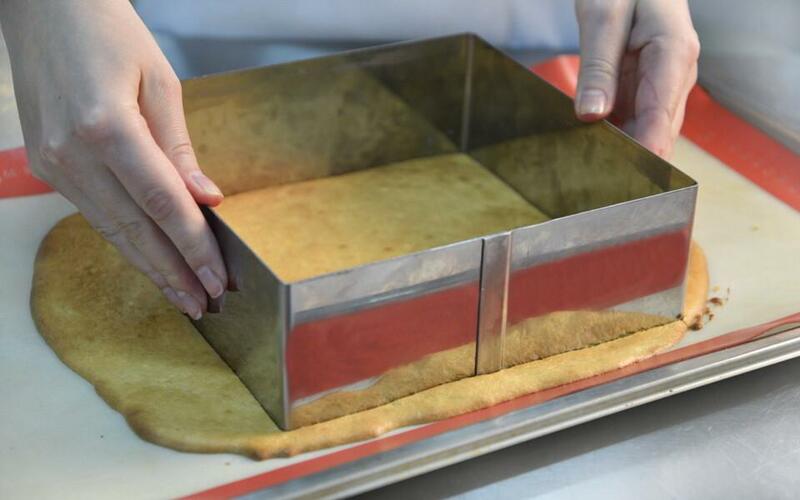 The dough should be enough for 3 squares and should make 18 cm. from a side. Bake on 220-230 C for about 5 minutes. Turn the baked biscuit on a baking paper and let it cool. Then cut it into squares. Orange jam: Heat up water and sugar, add thinly grated orange zest and let it boil for 3 minutes on a middle fire. Then drain it and keep only the zest. 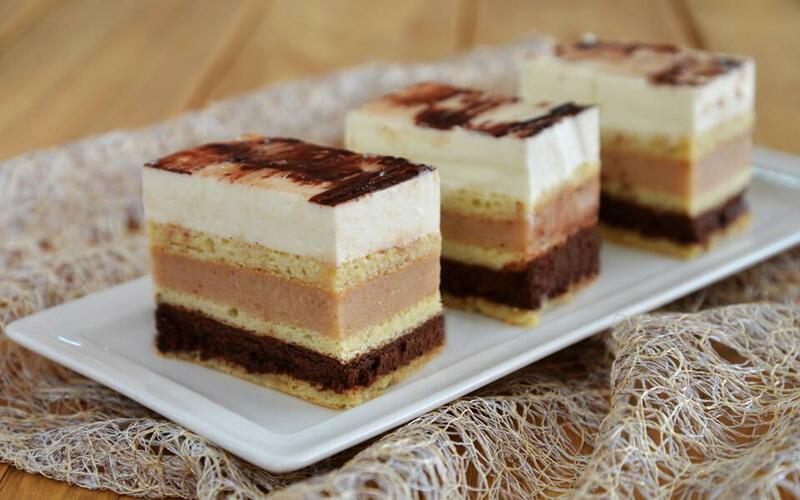 Chocolate cream: Whip crème and melt the chocolate but do not heat too much. Beat with zest and whipped crème and use immediately. Setting – part one: Place 18 cm. thick first biscuit on a cake pan and moist with syrup. Spread chocolate cream on it, top with the second biscuit and press lightly. Moist the second biscuit and keep it in the fridge until the gelatin is ready. Banana jelly: Soak gelatin in the cold water and let it dissolve. Prepare banana puree add your lemon juice, sugar powder and toss on a fire to bring to boiling. Move it from the fire and beat with gelatin. Whisk in the blender and add Rum. 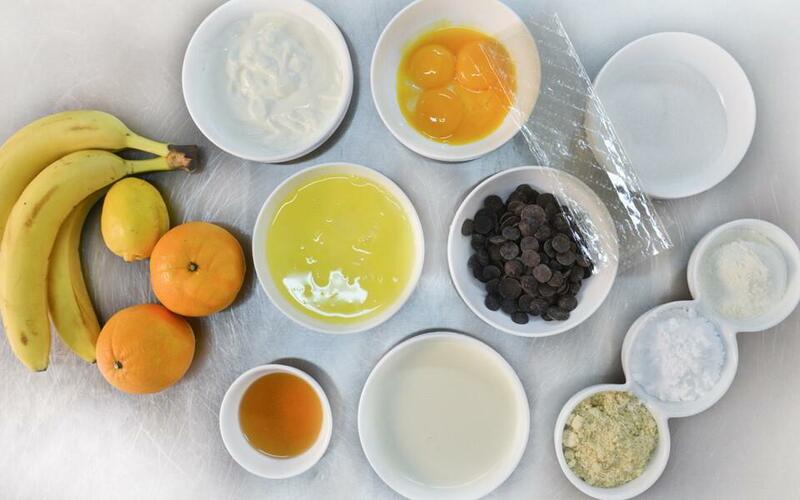 If using orange juice it can be warmed up together with banana puree. Setting – part two: Take the first part of the cake, spread banana jelly evenly, top it with the third biscuit and moist. Keep it in the freezer, until the third part is ready. Vanilla yogurt layer: Soak gelatin in the cold water and let it dissolve. Condense the crème (but not turn it into a butter) and beat 200 gr. thick, natural yogurt with vanilla extract. Add vanilla powder to 50 gr. yogurt and warm it up on about 75-80 C in order to get the gelatin melted. Add Gelatin, whisk and pour all of this into the crème yogurt and use immediately. Setting – part three: Spread the vanilla yogurt layer on the last remained biscuit and keep in the freezer for overnight. 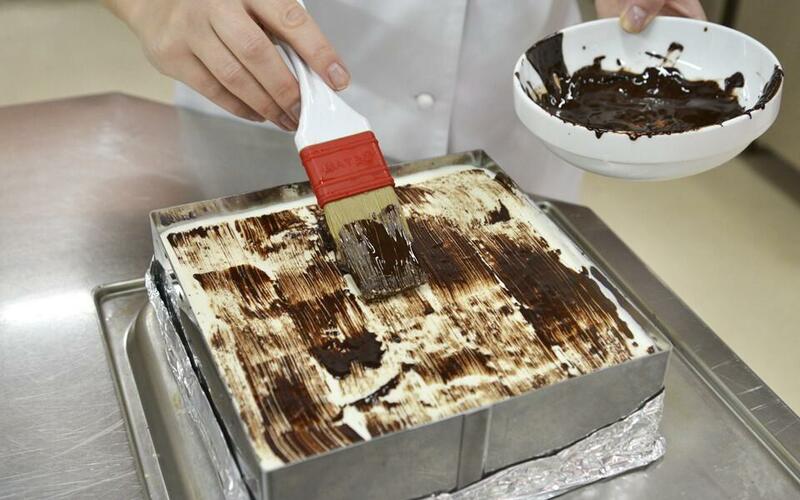 Decoration: Melt a chocolate and beat with vegetable oil. Warm up the neutral glaze to sparse and add some Rum. Take the cake from the freezer and remove the pan frame. Take a small stick and paint some chaotic picture on the vanilla yogurt frozen surface and wait until it gets frozen again. Then cover the cake with your neutral glaze. You can cut your cake in 5-10 minutes. Prepare a nonalcoholic syrup using vanilla pods and seeds. Heat up water and sugar until the sugar is melted. Move from the stove and add some Rum.